Abstract: New York City was occupied by the British for the duration of the Revolutionary War. Tens of thousands of American insurgents, civilian as well as military, were detained in and around Manhattan, the great majority under scandalously horrible conditions. As many as 18,000 may have perished--nearly three times as many as the number who died in battle. For a number of reasons, including the Anglo-American rapprochement that began around the turn of the 20th century, historians have generally downplayed the magnitude of the disaster. Professor Burrows presented this talk at a symposium, “The American Revolution on Long Island and in New York City,” held at Stony Brook University on October 4, 2010, and co-sponsored by the Three Village Historical Society, the LIHJ, and Stony Brook University. [Anon. ], Journal of Dr. Elias Cornelius, a revolutionary surgeon: Graphic description of his sufferings while a prisoner in Provost jail, New York, 1777 and 1778, with biographical sketch (Washington, D.C: C.M. Tompkins and C.T. Sherman, 1903). I want to begin with a little story. Some of you may have heard it before, but it’s a good story. Besides, all of you know by now that while history doesn’t repeat itself, historians do. So bear with me. The hero of the story is a young man named Elias Cornelius, a native of Suffolk County, Long Island. We know little of his background, except that when the Revolutionary War began he was studying medicine with Dr. Samuel Latham, a prominent physician in North Hempstead. In the autumn of 1776 – probably not long after Washington’s forces were driven off Long Island – Elias fled across Long Island Sound to New England. It was a decision made by thousands of Long Island residents, many of whom would not return to the Island for another six or seven years. 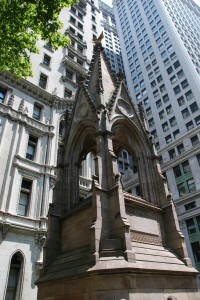 Figure 1: Monument to Revolutionary War prisoners at Trinity Church, Manhattan. Photograph by Joshua Ruff. We know a good deal about what happened next because at some point before his death in 1823, he recounted his experiences in a “journal” that would be transcribed and published at the end of the 19th century by his grandson. The journal tells us that early in 1777, now barely twenty years of age, Elias was commissioned a Surgeon’s Mate in the American Army and attached to a regiment of Continentals from Rhode Island. The following August, while reconnoitering British positions near East Chester, he blundered into an enemy patrol and was taken prisoner. He and a dozen other American captives were stripped of their possessions and marched down to New York City under heavy guard, passing through a gauntlet of jeering, stone-throwing Tories as they reached the outskirts of town. Their destination was a sugar house on Crown (now Liberty) Street, just east of Broadway. This massive five-story stone building – one of the largest structures in the 18th-century city – had been commandeered as a prison for rebels rounded up after the disastrous Battle of Long Island and after the capitulation of Fort Washington that followed two months later. By the time Elias got there, it held around 800 men. 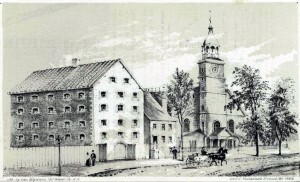 Figure 2: Old Sugar House, Manhattan, 1830, in an illustration from 1858. The sugar house was filthy beyond description, Elias recalled. “The top of the House was open to the weather, so that when it rained the water ran along and through every floor and on that account it was impossible for us to keep dry.” The sergeant in charge was vicious and corrupt. He stole much of their food, leaving Elias and the men captured with him only “4 pounds of poor Irish Pork and 4 pounds of mouldy bread for 4 days.” When Elias asked for pen and paper to petition for parole, the sergeant gave him a beating instead. He then sent Elias to another prison, where he was sequestered in a basement dungeon with several other Americans. 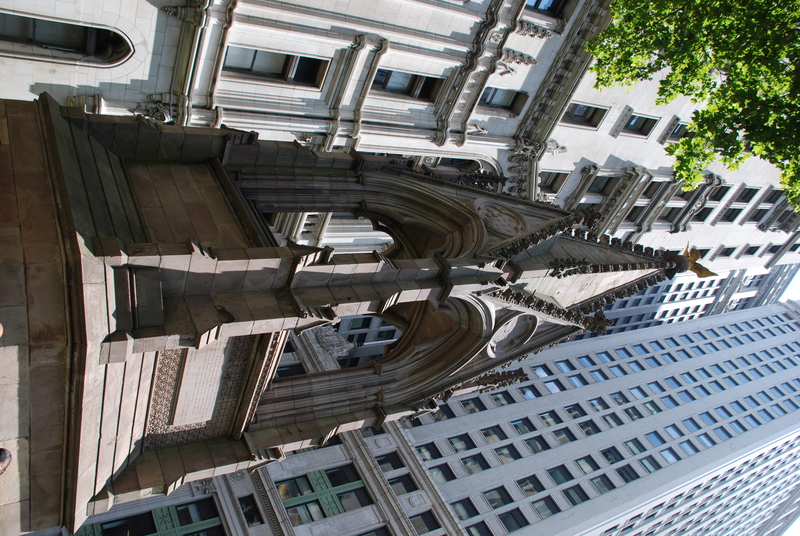 This was the equally notorious Provost, formerly the city’s New Gaol, which stood in the northeast corner of the municipal Common (now City Hall Park) – “a hideous place,” Elias called it. But Elias got lucky: he developed a cough and fever in addition to the scurvy, which sooner or later afflicted every American prisoner. In mid January 1778 they him sent up to the infirmary that had been established in the Brick Presbyterian Church. One evening, he clambered over a fence and fled into the gathering darkness. Still so sick he could hardly stand, Elias headed west, to the other side of Broadway. He circled St. Paul’s Chapel, then turned uptown, past King’s College, dodging sentries and keeping to the shadows until he reached the Hudson River. His plan was to cross over to New Jersey, only he couldn’t find a boat. In desperation, he struck out for the East River, on the opposite side of Manhattan, where he hoped to find a way over to Brooklyn. “Soon the moon arose and made it very light,” he recalled, “and there being snow on the ground, crusted over, and no wind, therefore a person walking, could be heard a great distance.” He saw soldiers everywhere and often had to crawl along on his stomach to avoid being discovered. Dogs snarled and howled as he passed. Eventually, miles from where he began, he came to the East River – except he couldn’t find a boat there, either, and had to pass what remained of the night huddling miserably under some bushes. Next morning, exhausted, hungry, footsore, and numb with the cold, he was on his way back to town, perhaps to turn himself in, when some “friends of America” gave him food and put him up for a few days. They then helped him over to Long Island, where he hid out in the woods with two other escaped prisoners until they were able to steal a small boat and row across the Sound to Norwalk, Connecticut. From Norwalk, Cornelius and his companions set out on foot to rejoin the American army wintering at Valley Forge, Pennsylvania. They arrived, finally, near the end of March – a full six weeks after he made his escape from the Brick Church. The story of Elias Cornelius is a reminder that from 1776 until 1783, New York City was the headquarters of British operations in North America. It was also the principal detention center for captured American insurgents—civilians as well as soldiers and sailors, officers and enlisted men alike. As young Elias’s story also tell us, captured American insurgents were detained in a variety of public and private buildings scattered around the city – the municipal almshouse and jail, a half-dozen churches, the classrooms of King’s College (now Columbia University), a couple of sugar houses, and one or two taverns. Broken-down warships were also pressed into service as prisons after they had been stripped of sails, masts, and other usable equipment. Eventually, these hulks would all be anchored in Wallabout Bay, a shallow inlet on the Brooklyn side of the East River (remembered today as the site of the old Brooklyn Navy Yard). These facilities, most of which remained in use for the duration of the war, were shockingly overcrowded – twenty men per cell in the city jail, eight hundred in one of the churches, over eleven hundred in the steaming hold of the Jersey, most notorious of the Wallabout hulks. Figure 3: Illustration of the interior of the Jersey prison ship. Prisoners never had enough to eat, and what they did have was barely edible. Their clothes were infested with ticks and lice. The water stank. The slop buckets and necessary tubs overflowed. Anyone lucky enough to survive the rampant typhus, dysentery, and smallpox eventually succumbed to the scurvy, which made their teeth fall out and caused their gums and eyes to bleed incessantly. Those who got out alive told of comrades so hungry they ate their own shoes and clothes, of prison ships whose decks were slippery with excrement, of wagons rumbling through the cobblestone streets with corpses stacked like cordwood, of bodies flung carelessly into Wallabout Bay or hastily interred by the dozen on nearby beaches. When a man died, he was carried up to the forecastle and laid there until the next morning at 8 o’clock when they were all lowered down the ships sides by a rope round them in the same manner as tho’ they were beasts. There was 8 died of a day while I was there. They were carried on shore in heaps and hove out the boat on the wharf then taken across a hand barrow, carried to the edge of the bank where a hole was dug 1 or 2 feet deep and all hove in together. There were no berths or seats, to lie down on, not a bench to sit on. Many were almost without cloaths. The dysentery, fever, phrenzy and despair prevailed among them, and filled the place with filth, disgust and horror. The scantiness of the allowance, the bad quality of the provisions, the brutality of the guards, and the sick, pining for comforts they could not obtain, altogether furnished continually one of the greatest scenes of human distress and misery ever beheld. [When I came aboard the Jersey it] was . . . the middle of October, the weather was cool and clear, with frosty nights, so that the number of deaths per day was reduced to an average of ten, and this number was considered by the survivors a small one, when compared with the terrible mortality that had prevailed for three months before. The heat so intense (the hot sun shining all day on deck) that they were all naked, which also served the well to get rid of the vermin, but the sick were eaten up alive. Their sickly countenances and ghastly looks were truly horrible; some swearing and blaspheming; some crying, praying and wringing their hands, stalking about like ghosts and apparitions; others delirious and void of reason, raving and storming; some groaning and dying, all panting for breath; some dead and corrupting. The air was so foul at times, that a lamp could not be kept burning, by reason of which three boys were not missed until they had been dead three days. One person only is admitted on deck at a time, after sun-set, which necessarily occasions much filth to run into the hole [hold], and mingle with the bildge water. Friday, 13th of Decr. 1776. We now see nothing but the mercy of God to intercede for us. Sorrowful times, all faces look pale, discouraged, discouraged. Tuesday, 17th. We are treated worse than cattle and hogs. Friday, 20th. Prisoners hang their heads and look pale. No comfort. All sorrow. Sunday, 22nd. Last night nothing but grones all night of sick and dying. Men amazeing to behold. Such hardness, sickness prevails fast. Deaths multiply. . . . All faces sad. Friday 27th. Three men of our battalion died last night. Officers generally had an easier time of it. Those of sufficiently high rank were allowed to find lodgings in the city. Others—perhaps four or five hundred in all—were paroled to Flatbush, New Utrecht, Gravesend, New Lots, and other Kings County villages, where they boarded with local farmers until officially exchanged. But they were the lucky exceptions. Altogether, something like 30,000 Americans were confined in New York at one time or another during the Revolutionary War. A 60 percent mortality rate would mean an overall total of some 18,000 fatalities. That may not seem like a lot by modern standards, but remember that the population of the entire United States in 1780 was under 3 million people—less than half the size of New York City today. During the Revolutionary War, in other words, more Americans lost their lives in the prisons of New York, and the prison ships of Brooklyn, than anywhere else – between two and three times as many as those who died in combat. The impact on local communities was absolutely crushing. Consider, for example, the thirty-six men from Litchfield, Connecticut, who went to the defense of Fort Washington. Four were killed and thirty-two taken prisoner. Twenty died in the prisons of New York, another six on the way home. Only six returned to Litchfield—six of the original thirty-six. 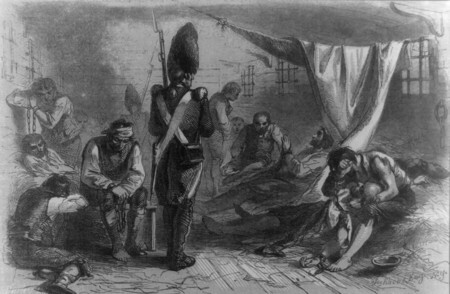 Half a company of 100 men raised in Danbury, Connecticut, was captured at Fort Washington and confined in one of the sugar houses. Two survived. Connecticut was not alone. Of the 130 militiamen from Northampton County, Pennsylvania, who were captured on Long Island, only 40 made it out of New York alive. So, too, seventeen young men from Berkeley County, Virginia, took part in the defense of Fort Washington and wound up in the prisons of New York City. Fifteen did not last the winter, their names and dates of death sorrowfully recorded in the journal of the captain who had led them so far from home. Of the two ailing survivors, only one lived until summer. Stories of this kind, wrapped in bitterness and grief and pride, suffused local memory and family legend for generations. They were still being told in Flatbush and other country villages of Kings County well into the 1860s and 1870s—almost a century later. Granted that this is a gruesome story, almost certainly more gruesome than we’ve realized, but what difference does it make at this point in time to our understanding of the American Revolution? Let me suggest several answers to that question. First, it’s more important than ever to know how the United States was made—not merely by those gentlemen in powdered wigs and knee britches we have heard so much about in recent years, but also by thousands upon thousands of mostly ordinary people who believed in something they considered worth dying for. I’m sure you have noticed the recent burst of interest in the so-called Founding Fathers—not only a new round of books on the likes of Thomas Jefferson, Benjamin Franklin, and George Washington, but the critically-acclaimed TV miniseries on John Adams and a glitzy exhibit on Alexander Hamilton at the New-York Historical Society. You’d think they won American Independence all by themselves, but there are thousands upon thousands of their countrymen who have largely been erased from the story. Those who perished in captivity often had a choice, too. British recruiters routinely scoured the prisons and prison ships looking for men willing to buy their freedom by enlisting in the royal army or navy. Many did. But most did not, and their solidarity in the face of almost certain death tells us something important about how the Revolutionary movement survived an 8-year-long war. Second, this story helps explain why the British lost the war. Accounts from the prisons and prison-ships of New York filled American papers. They prompted Philip Freneau to write his famous epic poem, “The British Prison Ship.” They created a market for the memoirs of former prisoners like Ethan Allen, whose narrative of his experience in captivity is said to have been the most widely-read book in America before Uncle Tom’s Cabin. These accounts solidified anti-British feeling in the rebellious colonies. Along the way, they helped Americans conceptualize the difference between us and them; two very similar nations in language and culture, but they were “cruel” and we were not. Indeed, in wartime propaganda on the American side, “cruelty” became the thing that most sharply set the adversaries apart from one another. Not language, or religion, or culture, or ethnicity—but the treatment of captives. Cruelty was the personality of tyranny. There is at least anecdotal evidence, too, that accounts of prisoner abuse in New York – not unlike Abu Ghraib and Guantanamo in our own time – boosted recruiting and stiffened morale in Washington’s army. Evidently, it was as true then as it is today: you can’t win counter-insurgency wars by behavior that embitters your enemies and makes them stronger and more determined. Abusing prisoners, for whatever reason, is no way to win the hearts and minds of suspicious, often openly hostile populations. There is a third reason why this story matters. At the time of the American Revolution there were no multinational treaties or conventions governing the treatment of prisoners of war, nor would there be for more than a century. Besides, Parliament and the administration adamantly refused to classify captured Americans as prisoners of war on the grounds that doing so would constitute de facto recognition of Congress. That did not change until after Yorktown, when the independence of the United States could be denied no longer. However, once the war was over, Congress instructed Benjamin Franklin, John Adams, and Thomas Jefferson—the principal American diplomats in Europe—to negotiate treaties with foreign powers that would, among other things, ensure the humane treatment of POWs in the event of war. These instructions were a direct outgrowth of what Americans had experienced as captives of the British, and the agreements that the three Americans negotiated were unprecedented. Never before had countries at peace with one another taken such a step. In retrospect, it was the beginning of a process that would lead to the Geneva Accords in the 20th century. Now, you’d think that a story of this magnitude would have been told many times over already. After all, in the two hundred-plus years that have elapsed since the Revolutionary War ended, that experience has been studied in almost microscopic detail, over and over again. There are entire research libraries in this country whose shelves are sagging with books about the American struggle for independence. Except perhaps for the Civil War, it is arguably the most studied subject in our national history. Sadly, though, the story of these prisoners has been almost entirely neglected—which is of course why I refer to them in my recent book as “forgotten patriots.” Even historians who specialize in the American Revolution are surprised by the scale and horror of what took place. So how do we explain this? Why has such a big story—and I think it is a big story—attracted almost no attention from historians in the last two centuries? You probably have some ideas of your own, but I’d like to offer two that seem especially relevant. The first of them has to do with the relentless transformation of New York City’s built environment over the last 200 years. Other than St. Paul’s Chapel on Broadway (completed in 1766), tiny Bowling Green (enclosed by the same cast iron fence it had in 1776), and the Morris-Jumel mansion in upper Manhattan (built in 1765), every tangible connection to Manhattan’s Revolutionary past has vanished (except for a small handful of farmhouses, it’s pretty much the same story in Brooklyn, Queens, Staten Island, and the Bronx). Of the places where thousands of American prisoners died from starvation and disease – the churches and sugar houses, the jail and almshouse, the prison ships of Wallabout Bay – nothing at all survives. Most of these sites, in fact, had disappeared from the urban landscape well before the Civil War. Think for a moment about the difference between New York and, say, Philadelphia or Boston. As we all know, those cities have preserved multiple physical links to the Revolution. Think Carpenter’s Hall, Paul Revere’s house, Bunker Hill, and so forth. New York, on the other hand, is the most historicidal of cities. Its residents seem to delight in the defeat of history. They have no patience with it. People come here to escape the past, not to find it – they want to start over, fresh, free of the dead weight of musty tradition. They look ahead, to the future. What happened before is of little or no consequence. New Yorkers are too busy. Besides, real estate values being what they are, history doesn’t pay. Put this way, it’s not surprising that the story of those suffering Revolutionary War prisoners has been so neglected. So has almost everything else in New York connecting its residents to the Revolution. Why is it so hard to remember that biggest battle of the war was fought in Brooklyn, just a few miles from here? Because the site has long since vanished – re-graded, paved over, built up, fenced in. True, there are a few monuments here and there – the Prison Ship Martyr’s Monument in Fort Greene Park, another monument to the Sugar House prisoners tucked into a corner of Trinity Churchyard. But monuments and statues are a poor substitute for the actual place where something happened that is worth remembering. When the place disappears, our memories disappear as well. 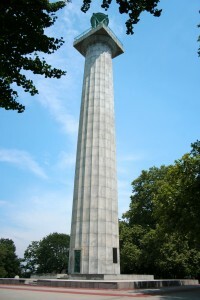 Figure 4: Prison Ship Martyrs’ Monument, Fort Greene Park, Brooklyn. Photograph by Joe Unander. I said there were two reasons that nobody much remembers the prisoners of New York. The second one is a by-product of the Anglo-American “special relationship” that germinated toward the end of the 19th century, then bloomed in the heat of two world wars. After years of pretending that American history began in 1776, scholars in many disciplines—political science and sociology as well as history—began to emphasize the English foundations of key American values and institutions. There was spirited talk of the need to protect Anglo-Saxon civilization unity from the barbaric hordes of Africa and Asia. Not surprisingly, the American Revolution began to seem like an unfortunate squabble between two kindred peoples—a regrettable and probably avoidable family quarrel, as one historian put it. Anything that threatened to revive memories of the long, bitter struggle for American independence began to seem downright disloyal. Consider, for example, the decline of Evacuation Day – November 25, 1783, the day the redcoats finally left Manhattan. For much of the 19th century, Evacuation Day had been one of the most important holidays in New York—an occasion for huge parades, fireworks, and patriotic speechmaking.) But after the turn of the new century, fewer and fewer residents of New York seemed interested in the event. The crowds dried up, the marching bands stayed home. So far as I can tell, the last official observance of Evacuation Day took place in 1916, when a few old veterans dressed in Revolutionary War uniforms took the Number 1 train down to the Battery. There, in a chilly drizzle, they hoisted the flag, saluted, and returned home. A few months later, the United States declared war on Germany. 140 years after the Declaration of Independence, the United States and Great Britain had become allies. The outbreak of World War I only deepened the reluctance of scholars to deal with the mistreatment of prisoners and other unpleasantness during our struggle for independence. Indeed, the Wilson administration made sure they toed the line by suppressing “The Spirit of ‘76,” a silent film with graphic scenes of British brutality that premiered in Chicago just months after the United States joined the fighting. The movie’s producer was charged with violating the Espionage Act and sentenced to twelve years in a federal penitentiary. Although he thought he was making a great patriotic epic, he was actually guilty, the trial judge said, of “creating animosity or want of confidence between us and our allies.” (The name of that case, ironically, was “The United States versus the Spirit of ’76.”) No matter that we had once fought a long and bitter struggle for independence against one of those allies: people didn’t need to be reminded of that inconvenient truth. Later in the century, at the height of the Cold War, one of our most eminent historians, Samuel Eliot Morison, made the same point in his biography of John Paul Jones (1959). We shouldn’t dwell on what happened to American prisoners during the Revolution, he cautioned, because it provide “fuel for American Anglophobes.” It happened, but no good purpose is served by talking about it. So let me leave you with this to think about: the POW story didn’t disappear, it was buried.